Michigan makes the trip to Salt Lake City to take on Jim Boylen’s Utes. Utah is coming off of a terrific year that ended with a disappointing first round NCAA tournament upset loss to Arizona. The good news for Michigan is that this year’s Utah team lost a significant chunk of production from last year’s team and appears to be in rebuilding mode. After losing only two home games last year, Utah has already fallen to Idaho and Seattle on their home court as well as Oklahoma State (neutral) and Weber State away from home. While it hasn’t been pretty at times, Utah has managed to win a few games including an impressive comeback win over Illinois. Judging by the depth and size of Utah’s roster, it’s clear that they don’t have a traditional mid-major roster. 6’5” wing Carlon Brown is Utah’s leading scorer, averaging 12.75 points per game with an eFG% of only 41.8% (and he can jump). He is joined by 6’5″ Luca Drca (8.9 ppg, 4.1 apg) and 6’2” freshman Marshall Henderson (9.25 ppg) in the backcourt. The Ute’s frontcourt size should dwarf Michigan’s undersized front line. Senior frenchman Kim Tillie, a 6’11” power forward, averages 9.75 points per game with an eFG% of 52.6 (4-10 3pt) while pulling down 6.8 rebounds per game (DraftExpress scouting). 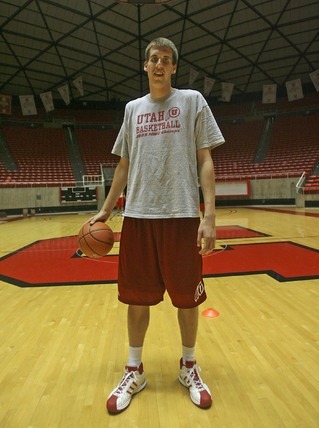 But he is short compared to the Utes’ starting center, 7’3″ sophomore David Foster, who averages 6 points, 5 rebounds, and 3.8 blocks per game. Utah’s bench contains six more players averaging 10+ minutes per game. San Francisco transfer Jay Watkins is the one the watch. The athletic 6’7″ wing forward is averaging 11.3 points and 5 rebounds per game since returning from a pelvis injury. Looking at Utah’s statistical profile it becomes clear why the Utes have struggled a bit this year. After shooting the lights out last year (54.6% eFG%, 54.1 2pfg%, 37 3pfg%), Utah is struggling to put the ball in the basket. Their effective field goal percentage is only 48.8% and they are making only 31.3% of their threes. They still do a great job of holding onto the ball (17.4% TO%) and manage to get the line at a respectable rate (40.1 FTR) but, especially for their size, they are a lackluster offensive rebounding team (31.1% OR). On the defensive side of the ball, Utah is allowing nearly a point per possession with a defensive efficiency of 98.7. They force very few turnovers and appear to be a mediocre defensive rebounding team. The downside for Michigan is that they defend the three point shot very well, allowing opponents to shoot only 30.6% from behind the arc. With all the size inside, it’s also not surprising that Utah blocks plenty of shots (12.2% block%). Utah has struggled this year but this game will not be easy. Michigan will have to snap out of their shooting slump on the road against a tall and athletic team that defends the three well. Carlon Brown says that Utah plans to try to keep the ball out of Manny Harris’ hands and force the other four guys to beat them. With a trip to Lawrence, KS and a home tilt with Connecticut on the schedule, Michigan has dug themselves into a hole where they simply have to win this game. A loss would make a 6-6 non conference record a very real possibility and leave Michigan plenty of work to do in conference play.